N'Ice Sugar Free Lozenges shower your throat with proven medicine to help quiet your cough and relieve minor sore throat pain. N'Ice also has a pleasant taste. N'Ice Sugar Free Lozenges shower your throat with proven medicine to help quiet your cough and relieve minor sore throat pain. N'Ice also has a pleasant taste. 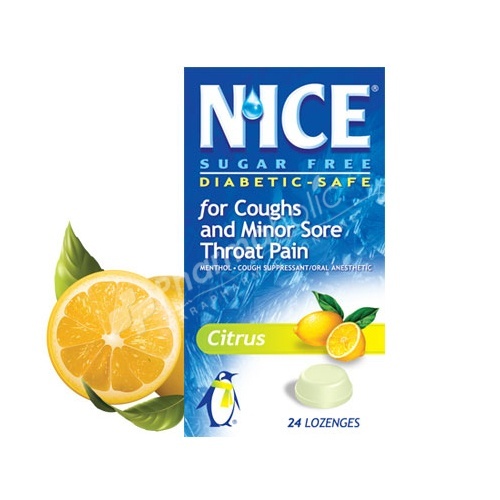 Each N'Ice lozenge is a smooth drop of medicine bursting with refreshing flavor that feels soothing and tastes good. And because they're Sugar Free, N'Ice lozenges do not promote tooth decay. Isomalt is a diabetic safe sweetener. Allow a lozenge to dissolve slowly in the mouth. May be repeated every hour (for coughs) or every two hours (for sore throat), for up to 10 lozenges per day, or as directed by a doctor. Adults and children 6 years and older: 5mg. Children under 6 years, ask a doctor. Acesulfame Potassium, Citric Acid, D&C Yellow No. 10, Eucalyptus Oil, Isomalt, Lemon Oil, Other N&A Flavors, Sodium Citrate.